Not to be confused with Wiltshire Farm Foods. Farmfoods Limited is a British frozen food supermarket chain based in Cumbernauld. The company has expanded throughout the United Kingdom, and has stores over 300. Farmfoods is a privately owned business in the United Kingdom, originated as an Aberdeen based meat manufacturing business. Farmfoods then began to freeze products to enable a wider geographical distribution to catering outlets. During the early 1970s an experimental freezer centre was set up in Aberdeen, which proved to be successful and in 1975, the entire business had changed its focus from manufacture distributor/wholesale on frozen food retail, with a further ten freezer centres were opened across Scotland, and Farmfoods in its current format was formed. By 1988, it had expanded to thirty one stores in Scotland. In October 2007, Farmfoods topped the table for private mid market firms in Scotland, although it only reached fourth in the United Kingdom. 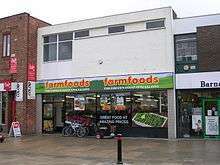 Farmfoods gained entry into England in around 1990, through the acquisition of eighteen stores from Wallis Frozen Foods. In the early 1990s, Farmfoods expanded further, with the acquisition of Capital Freezer Centres, as well as a few smaller freezer centre chains across the country. In 2011, Farmfoods had over specialist freezer centres over 300 across the United Kingdom. Farmfoods stores were typically located in city and town centres, but recently however, the chain has started to focus on out of town facilities. Although the company continues to focus on providing frozen food, in recent years it has developed a range of grocery items, including cleaning products, dried goods, canned goods, confectionery, chilled items, fresh fruit and veg and drinks. There is a mix of branded and in house brand or own brand goods. In March 2007, Farmfoods was fined a total of £16,000, and ordered to pay costs totaling £7,235, after being found guilty of two food hygiene offences, and one offence of selling food that was unfit for human consumption. These offences occurred in the store in Kirkby. In September 2010, Farmfoods was fined nearly £17,000, after a consumer found a mouse baked into a loaf of bread. In November 2015, another consumer found a dead mouse in their shopping from Farmfoods, this time being frozen cabbage. ↑ "Farmfoods tops table for private Scottish mid-market firms". 12 October 2007. Retrieved 30 November 2016. ↑ "Mice infestation costs Farmfoods store more than £23,000". 9 March 2007. Retrieved 30 November 2016. ↑ "Mouse found baked into loaf of bread". 28 September 2010. Retrieved 30 November 2016. ↑ "Horrified mum 'finds half a dead mouse in a £1 bag of Farmfoods frozen cabbage'". 3 November 2015. Retrieved 30 November 2016. Wikimedia Commons has media related to Farmfoods Ltd.